There is no need for a bacon panic! Last week a trade organization for pork producers sent out an alarmist press release threatening that next year may see a bacon shortage in the wake of this year's problems with the global corn crop. It's obvious if you scratch the surface that this is little more than a marketing gambit, and a successful one to boot. But that never stopped the presses before, and it hasn't stopped them since. Thus this week we have been treated to a rash of "Bacon Shortage Forecast" news stories that breathlessly describe a future in which there is no bacon. The first and most obviously suspicious thing about this news item is that it comes from an organization whose sole purpose is to convince the public to buy more pork. The National Pig Association of the United Kingdom is hardly going to put out a press release saying "Bacon supplies are fine, there is nothing to worry about" or even "2013 may see slight increase in bacon prices." That's not the kind of thing that will grab headlines, and more to the point, it's not the kind of thing that will frighten people into buying more bacon. This year has definitely been a bad one for the corn crop. Globally we were already seeing record high demands for corn, between the rise in its use as biofuel, and this summer's drought which caused many crops to fail. Corn prices will be rising for the next year, which is a pity, because we use corn in pretty much everything. 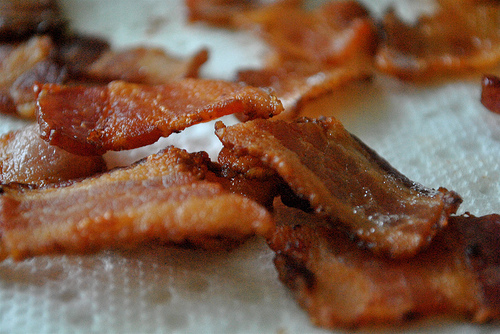 The price of food is going to be rising across the board, not just in the bacon aisle. Everything is going to be getting more expensive, which will cause a lot of global hardship. However, it isn't likely to cause a bacon shortage. It will probably, however, cause the price of bacon to rise. Which is too bad, because bacon is already pretty expensive stuff. Of course, it will also cause the rise of pork chop prices, not to mention beef and chicken prices too. But that again is not the sort of thing that grabs attention. The problem is, we feed corn to all of our meat animals. If their feed costs rise, so does the cost of their meat. So a bacon shortage? No. Bacon more expensive? Almost certainly yes. Frankly I don't mind too much, since bacon isn't a staple for me, it's more of a rare treat. I can handle having a price increase on occasional indulgences. It's the rising cost of staple foods that I find a lot more alarming.